Nurses will deliver talking therapy to breast cancer patients in a study aimed at improving access to treatment for hot flushes and night sweats. 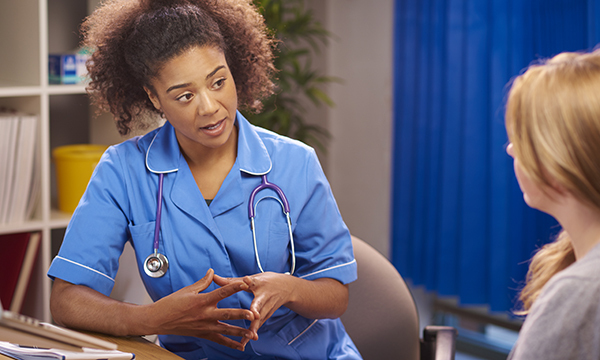 Breast care nurses are being trained to deliver talking therapy to patients in an effort to improve treatment for hot flushes and night sweats. The nurse-led research will investigate the best way to deliver cognitive behavioural therapy (CBT) to reduce these two major side effects in women undergoing breast cancer treatment. CBT is already proven to reduce hot flushes and night sweats. If it could be delivered effectively by nurses it would significantly improve access to this form of therapy for patients undergoing breast cancer treatment. At present it has to be delivered by clinical psychologists and is not routinely available on the NHS. Hot flushes and night sweats are experienced by up to 70% of women receiving treatment for breast cancer. Swansea University nurse researcher Deborah Fenlon has been awarded a grant of more than £300,000 by the charity Breast Cancer Now to lead a three-year clinical trial at the University of Southampton. The study will involve up to 160 women undergoing breast cancer treatment at seven hospitals across England and Wales who are experiencing severe and frequent hot flushes or night sweats. Half of the women will receive group CBT from a breast cancer nurse who has been trained by clinical psychologists, involving six weekly sessions of 90 minutes each. The other half will receive normal care.